Pros: Prose reads quickly and effortlessly; Action sequences are well written and fun. Cons: Ending and its twist are not set up at all and conflict with previous world building effort; Secondary characters get little to no development; Identity of "The Ghost" is drawn out for far too long; Some of the action sequences feel out of place. The Review: For better or worse, a lot of books are defined by their endings. A great ending will stick in the mind of the reader. A terrible one will see the book flung across the room in disgust. Unfortunately, the current state of my copy of Ghosts of Manhattan suggests it is one of the latter. Simply put, the conclusion to Ghosts of Manhattan is inexplicably poor. The best endings are ones that are completely unpredictable but in hindsight, perfectly arranged. The ending of Ghosts of Manhattan doesn't just come out of left field, it comes from a whole different sport and one that the first two hundred or so pages never even hinted was being played. Imagine if the Great Gatsby ended with an alien invasion led by the robot disguised as Daisy or if zombies killed Ric at the end of Casablanca. The seeming randomness of the final scenes was so problematic that the text itself was actually revised between the ARC edition and the final print run. In fairness to the work, I reread the final version to see if my qualms were addressed. They weren’t. From the beginning, Mann introduces us to the world of Gabriel Cross, a mash-up of Jay Gatsby and Bruce Wayne who spends his nights fighting crime as a vigilante known only as The Ghost. Like Batman, The Ghost has no actual superpowers, relying instead on gadgets and guns to clean up the streets of an alternate 1920s New York City. Unlike Batman, The Ghost has no problem killing people, making it difficult to sympathize with an often brutal enforcer. Mann’s version of the 1920s features coal powered cars, holographic communicators, and rocket powered airplanes giving it the steampunk vibe promised in the “Steampunk Superhero” tagline, albeit in an eclectic fashion. The jumble of worldbuilding elements is further compounded by the inclusion of more supernatural elements ranging from semi-sentient men of clay to xenobiological curiosities. There seems to be no limit to what can occur in Mann’s steampunk world and the lack of internal cohesion grows more and more evident as the story progresses. The plot seems to create the setting rather than the setting influencing the plot. This is a subtle but important distinction in the craft of genre worldbuilding and one that is largely responsible for the disappointing ending. 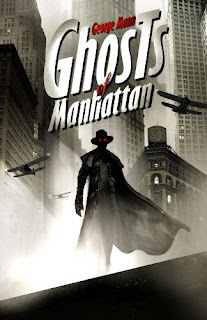 Before the veritable train wreck of the final chapters, Ghosts of Manhattan does manage to provide the fun, fast paced read it is advertised to be. Detective Felix Donovan and The Ghost cross paths in their investigations of The Roman, a new gangster who has been making his name killing city officials in grotesque fashion and leaving a pair of ancient coins on the victim’s eyes. The investigation soon becomes personal as The Roman’s henchmen attempt to abduct Cross’s love interest, Celeste. Before long, Donovan and Cross team up to find the Roman and put an end to his heinous crimes. In true pulp fashion, the book is more about the providing action than depth, resulting in several excellent fight sequences and a paper thin cast of characters. The action itself is the highlight of the novel and aside from the rather contrived and implausible rocket powered biplane chase it is all grand fun. Writing prolonged action without losing a sense of spacial awareness is very difficult and the Mann's scenes play out like an action film. There is a fluid grace to this aspect of his prose, allowing for narrative focus amidst the chaos. Despite any misgivings about the subject matter, there is no denying that Mann manages to keep the plot moving and the pages turning. Ghosts of Manhattan appears to be the first book in a sequence of “Ghost” stories. There is no denying the latent potential within the world of George Mann's steampunk superhero. If Mann can tighten up his plotting and find a better balance between character and action, future installments of this new series may be excellent indeed. Series debuts are often the weakest of the bunch (see The Dresden Files for proof) as the introduction of characters often comes at the expense of their development. Unfortunately, potential and actual are two different things and until Mann delivers on the pulpy promise hinted at in his action sequences, I can’t recommend Ghosts of Manhattan.